Victor Vlasov. Music for Children and Youth. V.Vlasov. Variations on Russian Folk Song "Steppe and Steppe Around"
V.Vlasov. Paraphrase on Ukrainian Folk Song "Oy, Khodyla Divchyna Berezhkom"
V.Vlasov. Variations on Belarusian Folk Song "Uzh Kak Vo Pole Nivushka"
V.Vlasov. 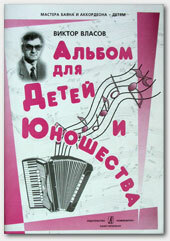 Variations on Ukrainian Song "Podolyanochka"
V.Vlasov. Paraphrase on Russian Folk Song "Akh, Ulitsa, Ulitsa Shyrokaya"
Video demo: Victor Vlasov. Turnip, Magpie, How the Clock Ticks, Three Bears, The Grumpy Goat. Video demo: Victor Vlasov. From Suite "Fairy Tales": Ugly Duckling, Little Red Riding Hood, King's Ball. Video demo: Victor Vlasov. From Suite "Fairy Tales": Brave Tin Soldier, Thumbelina, Little Thumb-Boy, Kolobok and King's Ball. Video demo: Victor Vlasov. From Suite "Fairy Tales": Turnip, Thumbelina, Brave Tin Soldier, Buffoons, Three Bears, Kolobok. Video demo: Victor Vlasov. Cat's House is on Fire, Thumbelina, Bafoons, Three Bears. Video demo: Victor Vlasov. Sonatina in C Major.